The SysInfoAction class provides the ability to add an action to the standard infolog. The user can then perform the action by clicking the infolog. The SysInfoAction class can be extended to perform custom actions e.g. opening a file using the default application. The example below uses the SysInfoAction_Formrun class and will open the "Accounts receivable parameters" form if the user clicks the infolog. The Infolog System can be easily customized in Dynamics AX. You can attach actions to the displayed messages in the infolog. Upon double clicking the message you can go to another form, related to the displayed message. Using the SysInfoAction_TableField class, you can easily add this functionality in your displayed messages. The job beneath shows you the example for this functionality. 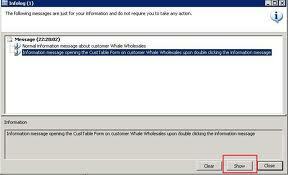 Double clicking will open the Customer form on the Customer determined in the X++ code. (Instead of double clicking, even you could click the Show button in the Infolog).